You are here: Virgin Islands News Online » News » Premier Smith fires back at Hon. Fahie on Opposition "Pressure"
Premier Smith fires back at Hon. 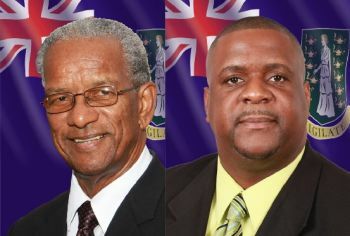 Fahie on Opposition "Pressure"
ROAD TOWN, Tortola, VI- Premier Dr the Honourable D. Orlando Smith has refuted First District Representative Hon. Andrew A. Fahie’s assertions that provisions for public servants’ increments in the 2013 budget were as a result of pressure from the Opposition. The premier, in a brief statement addressed to local media houses today December 11, 2012, referred to an article in one of the local news sites which quoted Hon. Fahie as saying that the National Democratic Party (NDP) Government would never admit that Opposition pressure resulted in public servants receiving their full performance increments in 2013. The NDP government came in for severe criticism from the Opposition earlier this year after it decided to reduce performance increments by 50%. “In truth, and as usual, the first time that the members of the opposition saw the estimates of expenditure for the year 2013, was at the time they were presented with the budget address on 15th November. The estimates then presented contained the provisions for increments for Civil servants,” Premier Smith argued. "Through our efforts, although Government would never admit such, the 2013 budget now includes the public servants' increments. This indeed is a victory for the public servants through the efforts of the Members of the Opposition. We thank God for that because evil only prevails when good goes to sleep. We will continue to fight for the rights of our people and for whatever is best for our people in a respectful, but yet forthright manner," the pro-government online news site had quoted Hon. Fahie as stating. Up to post time, Hon. Fahie had not responded to an opportunity presented by this news site to reply to Premier Smith's statement. me with fahie on tis one pressure bust pie! say the right thing nah! NDP stole from civil servants to give them friends consultancy!! !a bandar will always be a bandar. "that may be true but the vip left us broke"
IF V IP LEAVE THIS COUNTRY BROKE WHERE THE HELL THIS GOVERNMENT GET SO MUCH MONY FROM TO DO ALL KIND OF $h1+ PLEASE TELL ME NDP IS JUST A JOKE. Ha ha seems like glover park back on the job look spin…. Now the truth comes out! Why Fahie up and down with this nonsense? Always trying to bend the truth just for political points. HAHA! buss he bubble doc he lying backside. how he going negotiated it when he only saw it for the first time once it was in there? he think people stupid or what? negotiate what. jeez um bread the 2016 election ting start already deman? This is a new Doc Smith, he's not laying down and taking $H1+ like last time around, he responding to everything, crack the whip doc, don't mind the noise. We need to get rid of both NDP and VIP! that's our problem! I agree with you 1000%!!!! These two parties are the same but with different colors! I am a public servant and I can testify that we are with Andrew on this one!!!! the government is too big with many jobs being covered by too many people. cut out the dead wood THEN give raises. But as it stands, too much money is going out to people who don't deserve it. And we all pay for it. i dear you to name some dead woods? Very true! VIP have its issues with the leader and others on the party but for Fahie to literally railroad and undermine a fellow party member is so ridiculous. He ought to be shame for that type of behavior and for not being a team player. I am so fed up of some of the VIP elected persons blaming Fahie for their loss as well as blaming Fahie for VIP's loss in the 2011 general elections. It is the stupidest thing that I ever heard. Everyone outside of some of you in the VIP knew that those individuals were going to loose because of their own dumbness & stubborness & not by any doing of Fahie's. If Ralph was any kind of leader he could have acted on any problem VIP had & avoid what happened. Start putting the blame for VIP loss where it belongs...at the feet of Ralph Telford O'Neal. All who lost in the VIP brought it on themselves. I blame Ralph & you will hear that until next election & many more. He is a poor leader and that's why the VIP out of office. Thank God I know Fahie don't take on people like you with your foolishness. @ Foolishness - look at the state of our schools and tell us if education was really going from good to great under Fahie. mediocre is what you seem to enjoy!!! When a party loose blame the leader which is Ralph. If the VIP had one Minister that worked hard for the people was Fahie so ayo back off of Fahie with these non-factual nonsense. Put the blame for the VIP lost where it belongs which is on Ralph O'Neal & leave Fahie alone. Ralph is a poor leader! So you trying to say Fahie is suppose to be leader of the VIP?! Oh please stop smoking crystal meth and come back to reality. Fahie did excellent as Minister of Education. For sure he did better than the NDP's Lloyd Black & for your information Fahie did a lot of repairs to school but our children need to learn to respect the work of their parents' tax money. Repairs to school is an ongoing something & even when Myron repairs the schools now, months later he will be doing the same works agan. Also Fahie will make a good leader because he cares about the people and not about having power like some of the NDP people and some of the VIP that lost their seat and some who won their seat. Fahie just need to divorce himself from some of you evil VIP people that just wishing even more than some of the NDP for his demise. Spot on Fahie. !!! !.....the ndp spin docs tink we ah dam fools! !